One of the images of the boat deck of the Small Boat Harbour in Lerwick during the recent high tides showed a puzzling portion of something that one had never seen before: see http://voussoirs.blogspot.com.au/2013/12/surprising-mareel-numbers.html It looked very much out of character with the memories of Lerwick and the cruise ships and other boats that came into the harbour over summer. Now, in the middle of winter, a startling black and white banded shape could be seen to one side of the photograph. What was it? The Internet was searched. What else does one do these days when there is a puzzle to sort out? There was really nowhere to start other than with some guesses. Maybe the ship was a smart cruise ship, albeit out of season? The search revealed nothing. Was it a visiting research ship? There was no harbour record identifying any cruise ship or research vessel in Lerwick at this time. So it was surmised that what looked like a ship might have something to do with accommodation for the new Total gas plant being constructed at Sullom Voe. This search brought up references to accommodation vessels, with the most interesting one being a similarly decorated vessel that had been used for accommodation for drug addicts and their rehabilitation in Arnhem, in The Netherlands. It was named De Boei. Might this be of some use? The ship was searched. It had an end that looked the same as the portion in The Shetland Times photograph, and the circumstances appeared as though it could be likely that the vessel might now being used at Lerwick for accommodation. So with some hope, the buttons were pressed: nothing useful here. A collection of words was Googled: no revelations here either; so Images was clicked. An array of shipping photographs of all types and circumstances scattered over the screen. There in the middle of one row was the unmistakable image of the ship called De Boei with old Lerwick in the background. So it was the same boat identified in Arnhem. The image was clicked and an article from Shetland News opened. Here it was all explained. The vessel had been towed across to Lerwick to provide accommodation for the Total gas plant: see article below. In another location it was discovered that the De Boei had undergone a complete quality refit and had been renamed San Vitesse: see newsletter below. 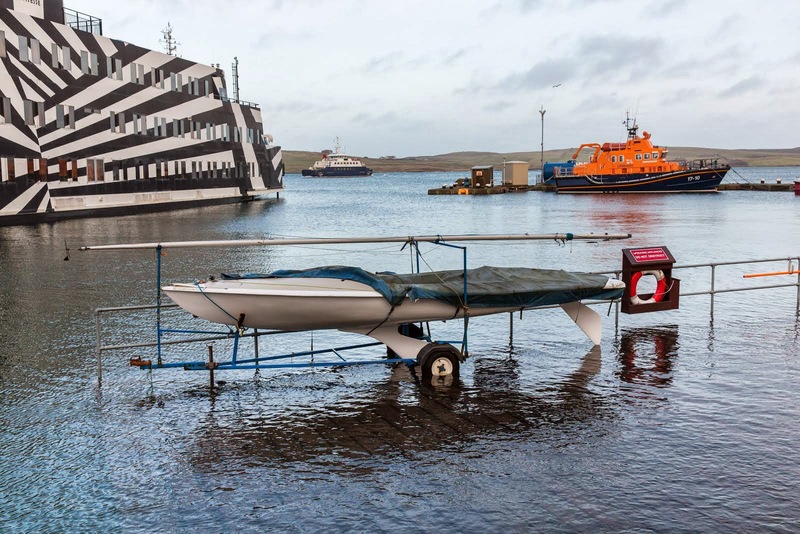 What is interesting is not the process of discovery, although it is, but the striking contrast with old Lerwick in the Shetland News photograph. Gosh, what do the locals think about staring at this remarkable object? 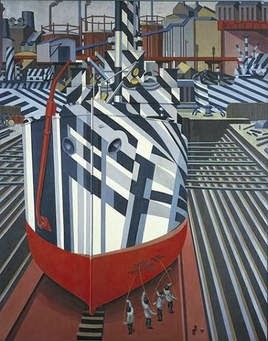 It is similar to the dazzle camouflage on WW1 vessels: see references below. The historic images are startling. Whether this decoration did in fact disguise these floating masses is unclear. The patterning certainly makes an interesting diagrammatic illusion that can be admired, perhaps for only a short period, in the same way as that on the San Vitesse itself can be considered. If nothing else, the glimpse of portion of this black and white, randomly banded ship in the high tide - apparently it had to be moved to a safer location at this time, hence the tugs in the photograph - did remind one of the history of such decoration and the intrigue of illusions. Maybe we need more of this imaginative approach today? Maybe Lerwick does not? Further research has discovered the full story of the ship, including a photograph of it prior to being painted black and white by an artist who, it appears obvious, was a great admirer of the older boats decorated in this manner. The change to the ship is stunning. The photograph in the newsletter shows that the patterning continues up and over the ship. Other items in the texts reveal some of the vessel's past. A few discussions tell of regular complaints from those who had to look at the banding every day when in Arnhem. On September 21, 2013 was seen the Muller – Dordrecht; Netherlands tug En Avant 7 with in tow the accommodation vessel Sans Vitesse. Assistance, by a speed of 5 knots on the river, was given by the Muller – Dordrecht; Netherlands tugs En Avant 4 and En Avant 21. The Sans Vitesse is the former drug boat De Boei of the municipality of Arnhem; Netherlands. Chevalier Floatels BV have bought her last year on speculation. The ship is virtually completely stripped and rebuilt by Instalho BV in Werkendam; Netherlands. The ship now has 101 rooms with private shower, sink and toilet. All rooms have TV and internet. In addition, the ship has now a large restaurant with cafe area. There is a spacious kitchen with the necessary stores and a large laundry. In particular through the use of very high-quality materials at the conversion. Chevalier Floatels BV think it is the most beautiful accommodation ship in the world in terms of Interior (for the professional market). The ship is rented to Petrofac for a project in Lerwick. They build there a gas factory for Total and needed more hotel accommodation. The other Chevalier Floatels BV ship the Kalmar is also rented to Petrofac and berthed in Lerwick already. That ship has 220 rooms, restaurant, cafe, fitness, laundrey, and recreation rooms. (Source: Chevalier Floatels; Photo: Reinier van de Wetering). 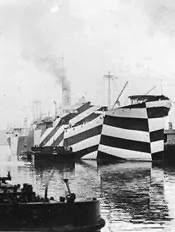 and the remarkable collection of photographs and drawings that appear in Google Images with this search: Dazzle Camouflage. TRADE UNIONS have accused Petrofac chiefs of “burying their heads in the sand” after members voted overwhelmingly in favour of industrial action. It is part of a long-running dispute which centres on unrest about accommodation and travel time for workers helping to build French oil giant Total's new £800 million gas plant in the north of Shetland. On Tuesday the GMB union, representing members employed by engineering firm Balfour Beatty, confirmed that a ballot had resulted in its workers joining their Unite counterparts in backing action. More than 90 per cent of ballots returned by members of both unions were in favour. The unions want workers to be given an additional £50 a day to compensate for Petrofac's failure to provide suitable accommodation for those working on the new gas plant. They are also seeking payment for those staying on accommodation barges in Lerwick, who face lengthy journeys to and from the construction site near Sullom Voe. It is the latest escalation of a bitter row which most recently erupted in November as the GMB claimed 47 pipe fitters had been locked out because of the impending ballot. Petrofac insisted that the workers had simply been handed their notice as their services were no longer required. Both unions are calling for more talks with Petrofac aimed at averting a strike, but are clear that the company must make concessions to prevent a walkout. GMB said some workers employed by other contractors on the construction project were also involved in the dispute and would be balloted separately. GMB Scotland's secretary Harry Donaldson said the union was seeking “urgent” talks with Petrofac “to convey to them the ballot results and impress on management” the need to resolve the dispute. Donaldson said: “The employers need to sit up and take notice of this overwhelming vote and put forward an offer to resolve this long-running dispute. “Petrofac have buried their heads in the sand for too long on important issues on this project. They have tried to bully and ride roughshod over standard industrial relations practices throughout. Unite representative John Taylor said his members had voted overwhelmingly in favour of industrial action – though it is not, as yet, clear when any strike would take place. He said part of the discontent was down to some workers having to share bedrooms with their colleagues. There is also unhappiness at facing bus journeys of around an hour each way. Taylor told BBC Radio Shetland: “The accommodation issue is quite unique in the sense that most camps have single berth accommodation. This was built with two-man accommodation; it's virtually impossible for some people to get sleep. A Petrofac spokesman said it took the welfare of its workers “very seriously” and was “committed to working with all parties to reach a satisfactory outcome while delivering the project successfully”. He said the company was “surprised” by the outcome and questioned how high turnout for the ballot had been. The spokesman said it formed part of a “very attractive package” offered to workers including higher salaries than they could expect for the same work on the mainland. He added: “However we have always aimed to maintain a constructive relationship with the unions – and we'll be looking to meet quickly with them to see how we can move forward on this issue." The project, designed to process reserves from the Laggan-Tormore gas pipeline, began in early 2010 and is due to be completed by the middle of 2014. However various problems encountered during construction, unrelated to the industrial dispute, mean it is expected that some work will continue beyond the summer.